This is the self-help book that is read by people who don't read self-help books. 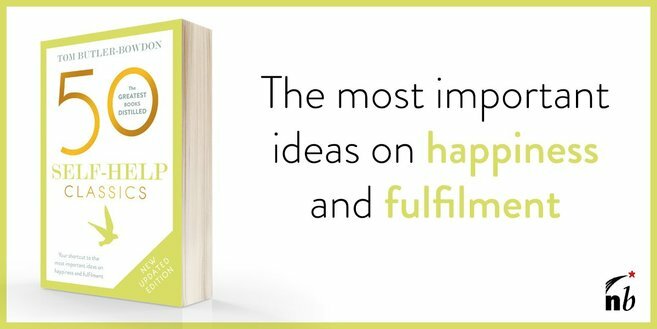 It contains none of the alluring promises of boundless joy and happiness that are the feature of personal development writing, yet has still been a massive bestseller. Famously beginning with the words, 'Life is difficult', it covers such gloomy topics as the myth of romantic love, evil, mental illness, and the author's psychological and spiritual crises. Perhaps because of its lack of rosiness, it is easy to give this book our confidence. The Road Less Traveled is inspirational, but in an old-fashioned way, putting self-discipline at the top of list of values for a good life. If you believe there are no easy ways to enlightenment, and that things like commitment and responsibility are the seeds of fulfilment, then you are belong in Dr Peck's territory. Peck was a conventionally trained psychotherapist, but has been influential in the movement to have psychology recognise the stages of spiritual growth. He sees the great feature of our times as being the reconciliation of the scientific and the spiritual world views. The Road Less Traveled was his attempt to further bridge the gap, and it has clearly been successful. The book is welcomed by anyone who has found themselves torn between the science of psychology and the spiritual search. Self-control is the essence of Peck's brand of self-help. He says: "Without discipline we can solve nothing. With only some discipline we can solve only some problems. With total discipline we can solve all problems." A person who has the ability to delay gratification has the key to psychological maturity, whereas impulsiveness is a mental habit that, in denying opportunities to experience pain, creates neuroses. Most large problems we have are the result of not facing up to earlier, smaller problems, of failing to be 'dedicated to the truth'. The great mistake most people make is believing that problems will go away of their own accord. This lack of responsibility will damage us in other ways. Our culture puts freedom on a pedestal, yet Peck recalls Eric Fromm's book Escape From Freedom, which looked at people's natural willingness to embrace political authoritarianism. It is referenced to support Peck's belief that, when it comes down to it, we shy from real freedom and responsibility. The Road Less Traveled is rich with the stories of real people. Some of the vignettes demonstrate the transformation of a life, but in other cases people just refuse to change, or in the end can't be bothered. Ring true? It is in these less extreme cases that we are more likely to see our own quiet turning away from a bolder, richer life. Rather than the horror of a mental illness, Peck says, most of us have to deal with the straightforward anguish of missed opportunities. Yet why is this so, when the rewards are so great? The road less traveled might be the spiritual path, but it is also a lot rockier and dimly lit next to the regular highway of life, which other people seem happy enough on. But Peck says that to ask this question of 'Why bother? ', we must know nothing of joy. The rewards of spiritual life are enormous: peace of mind and a freedom from real worry that most people never imagine is possible. Burdens are always ready to be lifted, since they are no longer solely ours. But deepened spirituality also brings responsibility; this is inevitable as we move from spiritual childhood to adulthood. Peck remembers St Augustine, who said: 'If you are loving and diligent, you may do whatever you want.' Just as our previous spiritual timidity and laziness resulted (as we can now see) in a very limited existence, so discipline opens the door to limitlessness in our experience of life. Only the more enlightened can be amused by the fact that others think they must lead a boring and restrained life; the walls that look stark from without may simply be shielding us from the glow of rapture within. The ecstatic state of being in love is in part a regression to infancy, a time when we felt our mother and ourselves to be one; we are back in communion with the world, and anything seems possible. Yet just as the baby comes to realise he or she is an individual, so the lover eventually returns to his or her self. At this point, Peck says, the work of 'real' love begins. Anyone can fall in love, but not everyone can decide to love. We may never control love's onset, but we may - with discipline - remain in charge of our response. And once these 'muscles' of love have been used, they tend to stay, increasing our power to channel love in the most life-giving and appropriate way. The discerning reader will note the contrast between Peck's belief that psychological change is necessarily slow, and the cognitive psychology view that our limitations can be removed without much trouble if we know how (see Seligman, Anthony Robbins). This is a basic divide in the self-help literature: the hard work ethic, components of which include building character and discovering soul; and the belief in mental technology, that our problems are not deep-seated and can be addressed by practical psycho-technological methods. If the former way is characterised by discipline and self-knowledge, the latter says that, if we only have the right tools, we can create whoever we want to be. Those readers who exclusively cheer for the latter should balance themselves by reading Peck. He discusses, for instance, an experience that is not referred to in modern psychology at all: 'grace'. A surprise burst of peace, gratitude and freedom, Peck feels it the highest point of human experience, fruit of a life of discipline and purpose. In his insistence on morality, discipline and admiration of long-suffering, Peck's writing can seem old-fashioned. Yet he is no conformist in his denouncement of the failure of psychotherapy to recognise people as spiritual beings, and the book has surprised many readers by its embrace of the Jungian, New Age concepts of the collective unconscious and synchronicity. Somehow, the blend of Christianity, the New Age and academic psychology works. Peck's classic will seem a little earnest for some, for others it will be full of life-changing insights. It is one of the giants of the self-help canon, having sold over seven million copies, and its title has entered the public idiom. In spite of what Peck says about resistance to spirituality, the less traveled road is clearly getting more traffic. Born in 1936, Scott Peck was raised on Fifth Avenue in New York and went to exclusive prep schools and Harvard. He gained his M.D. at Case Western Reserve University in 1963, after which he began a nine-year service in the Army Medical Corps (1963-72). Over the next decade he established his own psychiatric practice, before the success of The Road Less Traveled made him a much in-demand speaker. Though the book had been written in the mid-1970s, when Peck was 39, it did not make it onto the New York Times bestseller list until 1983. It thereafter stayed on the list for so long that it entered The Guinness Book of Records. Peck's later books include People of the Lie (1983) on healing human evil, The Different Drum (1987) on community life, and A Bed By The Window (1990), an inspirational novel. A World Waiting to Be Born (1993) looks at the idea of civility at the personal and societal level, while Denial of the Soul concerns euthanasia and terminal suffering. Spin-off titles include Meditations From The Road and Further Along The Road Less Traveled (1993) developed from lectures given around the world. He is also the author of Golf and the Spirit. Peck died in 2005. Obituaries: The Guardian, The New York Times.